The overall objective of the DrugMon project was to develop a biomarker based tool which will combine sewage measurements with modelling and epidemiology to establish the level of drug use within Norwegian communities. The project was a collaboration between NIVA, the Norwegian Institute of Public Health and the Norwegian Institute for Alcohol and Drug Research. through the use of sensitive and robust methods for the detection of cannabis, cocaine, amphetamine, benzodiazepines and ethanol and their metabolites in sewage samples. These methods use modern analytical techniques such as liquid chromatography coupled to mass spectrometry. 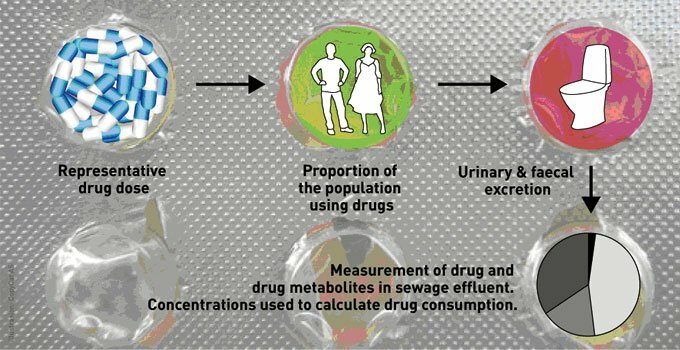 A back calculation protocol is then used to predict the scale of community drug use on the basis of the measured amounts of drug metabolites in sewage influent. These data can then be compared with those generated through conventional means such as population survey statistics or police records. A general overview of the approach is available at the European Monitoring Centre for Drugs and Drug Addiction (EMCDDA). DrugMon started in 2008 and funded by The Research Council of Norway under the RUSMIDDEL-programme.